There has always been an association between cigars and wealth, with many people believing that cigar smoking is a hobby exclusive to the rich and famous. This image is often reinforced in the media, with "I smoke cigars" being used as short hand for "I'm filthy rich!" Granted, this can be true with some brands; very few of us are lucky enough to have the cigar budget to smoke Behike 56s every day, after all! Thankfully, there are plenty of options for the rest of us and these options don't always mean we have to compromise on quality. If you know what to look out for it soon becomes clear that great cigars aren't just reserved for celebrities and witty Prime Ministers: they are there to be enjoyed by anyone, regardless of their income or lifestyle. With that in mind, here are my top 5 cigars that help bust that old myth! Machine made cigars don't always get the best reception from puro purists, but the Premium Tubos from Villiger proves that a good blend can go a long way. A Sumatran-Idonesian wrapper surrounds the 100% cuban filler which gives off crisp, woody notes throughout the smoke. The draw is very easy, a few people have commented that the burn is quite quick (such is the nature of short filler cigars), but at 6" in length it still offers around 20 minutes of smoking time. The relatively slender 38 gauge also makes for a slim, elegant alternative in a time when the market is inundated with heavy gauge behemoths (Texas Lancero, anyone?). Throw in a pre-punched cap and metal tube for convenience and you're onto something special. 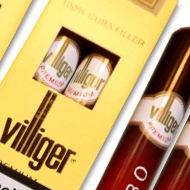 Click here to view our Villiger cigars range. This is proof that good things can some in small (and cheap) packages: A little, but extremely well made Nicaraguan cigar that boasts a full but well balanced blend. Powerful notes of cocoa and nuts are prominent from the first touch of flame and there is the occasional hint of spice, particularly when exhaled through the nose. At a little over £2 for approximately 20 mins of smoking it is easily one of the best value cigars on the market. Don't let its small dimensions fool you, give it a try and I'm sure you'll be pleasantly surprised! 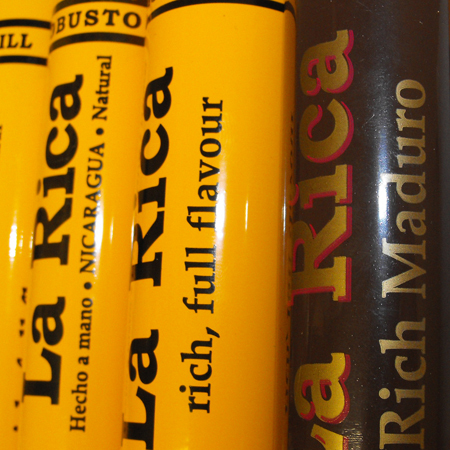 Click here to view our La Rica cigar range. I'm sure nobody's surprised to see the Inka range appear on this list, I think I'd be failing as a C.Gars Ltd employee if I wrote a list about good value cigars and didn't give them a mention! Our very own brand makes for an exclusive cigar and exceptionally good value. Hand made with 100% Peruvian tobacco, the Inkas offer something a bit different from the usual choices of New World cigar regions.The Bombaso's chunky 60 gauge is a real head turner and allows for copious amounts of medium to full bodied smoke from a very easy draw, with sweet and rich flavours and occasional hints of leather. Available in your choice of short or long filler and a natural or maduro wrapper, the only downside is... They're too popular! Get them while you can! 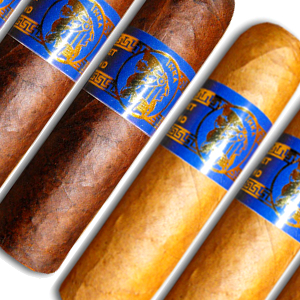 Click here to view our Inka Secret Blend cigar range. Charatan is one of the UK's bestselling New World cigars and when you look at the value for money it's easy to see why. The churchill - their most popular size - is handmade and measures an impressive 7" x 48 gauge and is available for just over £10, so it would be a bargain even if the blend was terrible! As it happens though this is a fantastic cigar: light wood and nut notes develop in a pronounced but gentle crescendo for at least an hour of smoky pleasure. This is all dressed in a wrapper so sleek and oily you'd be forgiven for mistaking it for a cigar twice as expensive. It's amazing how often I see someone buy one of these just because they want something "Big and cheap" purely for the aesthetic, but end up loving the cigar and coming back for more! 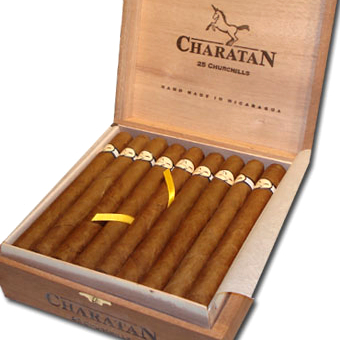 Click here to view our Charatan cigar range. In my opinion, this is the crown jewel of bargain cigars: A sizeable, handmade, long filler Havana for under £10... Simply amazing! Measuring 5 1/2" x 40 gauge, the Majestic is a "Crema" - just millimeters shy of the classic corona vitola - but it generally retails around £5 cheaper than other Cuban brands of a similar size, while still meeting the high standards you'd expect. The flavour is the perfect balance between light and medium: mild enough to be accessible to anyone (even novices!) but with enough strength to keep the blend complex and interesting for more experienced smokers. It can easily last at least half an hour and offers delectably creamy notes of subtly sweet coffee throughout. 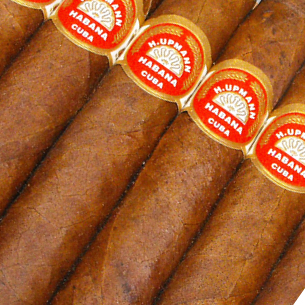 Click here to view our H. Upmann cigar range. So there we have it: five cigars that can fit into any budget without a compromise on quality! Hopefully that'll give you some ideas for next time someone says "I love cigars, but I can't afford to smoke them", as nobody should be excluded from such an enjoyable hobby, simply because they don't have enough money. After all, it's not about how much you pay for a smoke, it's about how much you enjoy it! You can view our full range of cigars for when you are on a tight budget here.